Since this series began with an Intro, found here, it only made sense to bookend with an Outro. 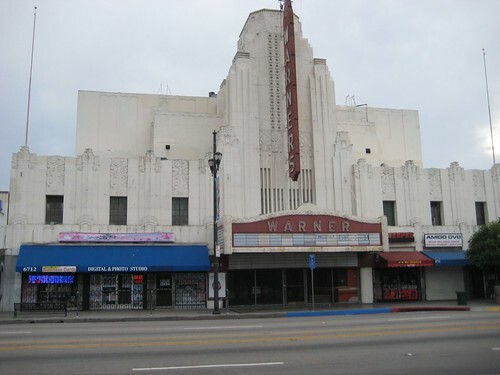 My thanks to the Los Angeles Historical Theater Foundation for their work in general, and Stephen Russo in particular, for their generosity in sharing info on their effort to give this movie theater its due, and letting me post links to this series on their Facebook page. If I’m lucky enough to revisit this venerable palace once again, hopefully inside the structure this time, I promise to include an update. Thank you to my brother who helped to hire and introduce me to the rare company that was the movie projectionist of a certain time. It was a gift that shaped me. 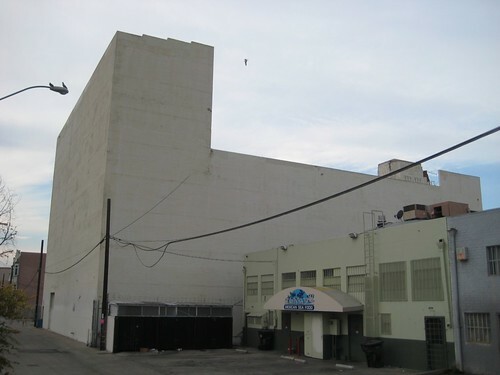 The photo of the theater’s exterior used for this series was done by William Gabel, circa 1972. The theater’s architect was B. Marcus Priteca, who designed many of the movie palaces on the West Coast, including those in Washington (Seattle, Tacoma, Yakima, Spokane, Centralia, and Olympia), Alaska (Anchorage & Fairbanks), British Columbia (Vancouver), California (Oakland, San Francisco, Fresno, San Diego, Beverly Hills, Huntington Park, and Los Angeles). Others of his were built in Canada, Utah, Minnesota, Montana and Tennessee. The theater’s style is Art Deco. Built in 1929-30, the original layout could seat 1468. Pacific Theaters was the last chain to operate this theater. 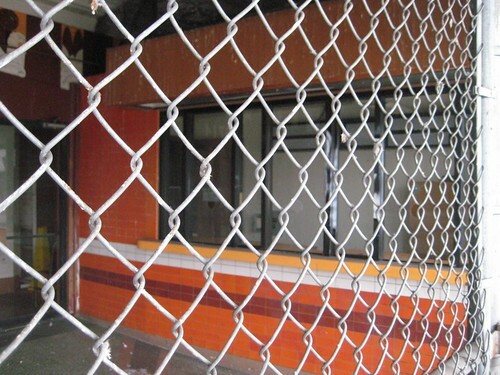 It was twinned early in the 1980s — meaning, the balcony was separated via renovation to install an additional (second) screen in the upper portion of the building. 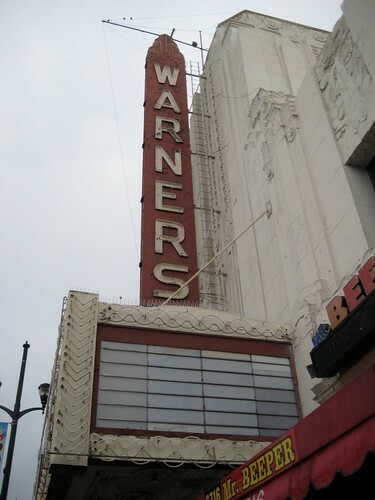 In July of 2007, the city fathers marked the venue as a designated historic resource. A wonderful webpage by the tireless Bill Counter (as part of his fabulous set of historic L.A. Theaters hosted here) has dedicated a marvelous collection of photos and links for this grand old lady that can be found here: Warner Theatre Huntington Park. The archive photo above was from what appears to be sometime in the 1970s. Note the rear high portion of the structure where the stage (Proscenium style) was housed. It held the mechanisms for the retractable movie screen, stage backdrops, rigging, curtains and lighting. 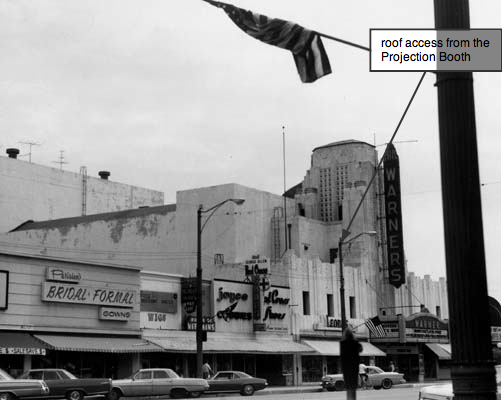 From the roof exit of the projection booth (indicated in the photo), one could easily see up and down most of the Pacific Boulevard shopping area. As well, access to other portions of the theater’s roof framework were available via adjoined ladders at various points along the top of the building — including the central section over the audience hall and all the way back to high point of the rear structure. You can see the lone, naked ladder in the photo that climbs up to that highpoint location, here. 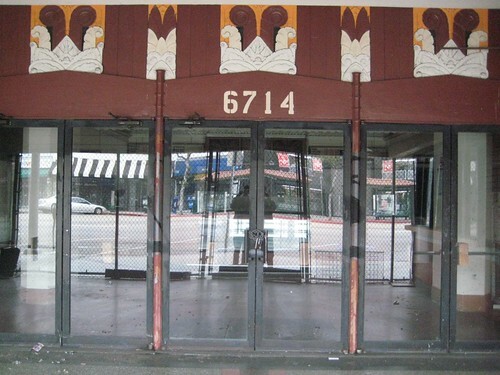 It provided one of the highest viewing whereabouts in the city of Huntington Park. I know of this personally. One day, my brother, a friend, and I took it upon ourselves to climb to that vantage point, in between changeovers during one movie reel. It was spectacular, to say the least. It was even more exhilarating (read scary) when it came time to climb back down that stage structure using that single and totally exposed ladder. Needless to say, we only did that silly stunt one time. This latter-day photo was from 1981. As you can see by the marque, Spanish-language movie content had returned to the theater by that time. The following photos were taken by me the day after Christmas in 2009. You can see the entire Flickr photostream set here. Sadly, it appeared the same or subsequent proprietor decided the marque, sign, and portion of entry facade needed to be painted. I suspect, as part of the twinning renovation, a newer modern style of box office was put in around this same time. 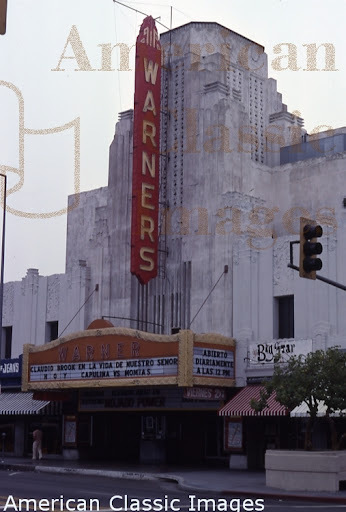 The old Art Deco-styled standalone box office, glimpsed in the older lead photo of the theater above, was completely removed. Hopefully, it is not lost. 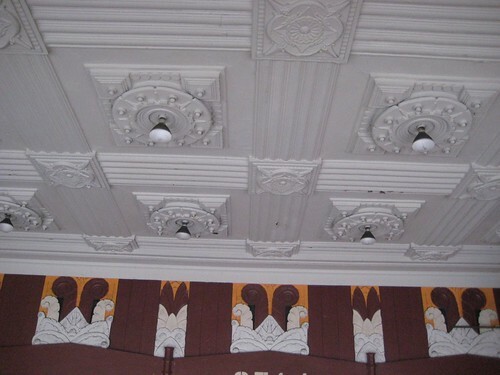 Although, a portion of the building’s beautiful motif used throughout the structure can still be seen as evidenced by the ceiling in the outer foyer. 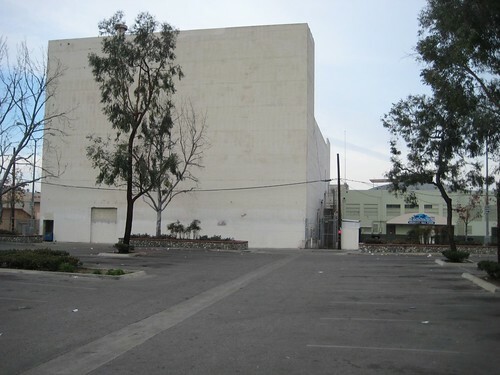 The rear of the theater, as viewed from the alley and public parking lot. You can see by the height of the rear stage portion of the building the old Portuguese proverb* had applied when we went on the roof exploration I noted earlier. * Translation: “To the child and the little bird (or drunkard), God catches the fall (puts a hand underneath).” Or the common variant, “God protects fools, drunks, and children…” We qualified on 2 out of the 3 on that day. Also, observe the large rear stage door. 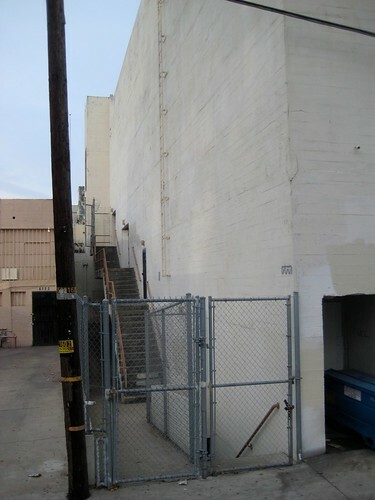 That service entrance would have been used when the theater presented a stage or orchestral event in its early existence. 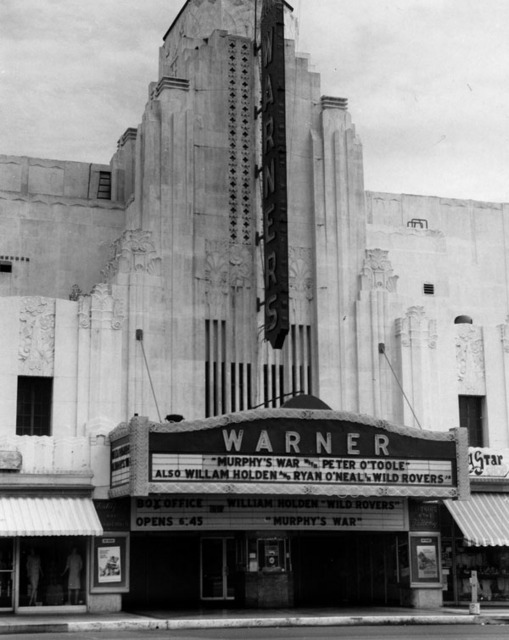 Way, way back in the day, the theater hosted multiple venues. 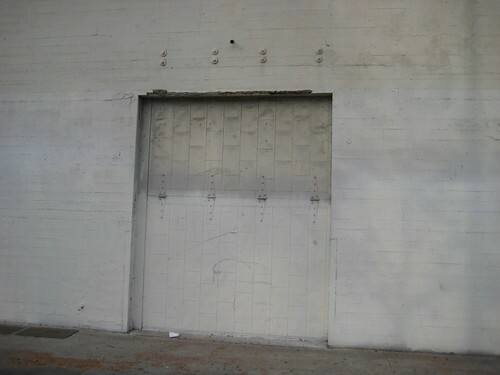 As well, pay attention to the side of the building. Both flanks had external exits and stairways. The upper exit doors were used during those times when friends or acquaintances were invited in by theater personnel in unauthorized (and un-ticketed) visits. Finally, notice the lower basement staircase (near the gated fence). The stage structure of the theater actually extended below street level. One day during my initial projectionist training, my brother walked me behind the screen, and all around the backstage area. This included the then covered and decked over orchestra pit and the rest of that under-stage segment. Even back in the 1976, this area had not been used for decades. I may not have commented on all in the series, but I read the vast majority of it and I feel really fortunate to have it as a look back into time, particularly now as the role of film in the motion picture industry is changing. Thank you Michael…I still maintain this and/or the TMT series would make a great documentary. I very much appreciate your readership and suggestions throughout, Paula. Maybe, if/when I get to see this movie theater more closing (and take my camera), the possibility of a documentary will be within reach. Many thanks, my friend. Another awesome TMT, yay! Congrats on being mentioned by Ebert’s site, but hey I’m not surprised Michael, you’ve got such excellent content here that no other blogger has. Great story, as always. Thank you very much, Ruth. You are a true friend and appreciate your kind words and following. I consider myself blessed. Thanks for this series, Michael. It was very enlightening all the way through. Thank you very much for reading and following it, Morgan. That is so cool that you were mentioned by RogerEbert.com, Michael. Glad to see your excellent work being recognized by some major sites. I’m still a bit shell shocked by that. Thankful, though, for it and your steady readership, Eric. That really was so cool. Many thanks Fernando. I appreciate your words and thoughts.